In the course of history, all kinds of people have felt at home in Boppard. Whether Celts, Romans or Franconians, each has left their mark on the 2,000-year-old history of the town. Present day Boppard is home to about 17,000 inhabitants and host to more than a million tourists annually. Boppard's history has been influenced by different royal families, electors and bishops, giving it a very unique cultural aspect. This medieval town, located in one of the best wine regions of the Mosel Valley, is crowded against the left bank of the river by a huge vineyard-covered hill. Because of its large number of inns, Cochem is your best choice for an overnight stopover between Koblenz and Trier. The town is a typical wine village, with tastings and festivals. But the biggest attraction is Reichsburg Cochem, a huge castle at the top of the mound behind the town. The original 1027 structure was almost completely destroyed by Louis XIV's army in 1689. It has since been restored according to the original ground plans, and its medieval ramparts and turrets create a dramatic backdrop for the town. Trier is a charming and very beautiful city. Founded by the Romans in 16 B.C., it is Germany's oldest city and exhibits architectural styles of the last 2000 years. Remich is a small town located on the Moselle River between Luxembourg and Germany. 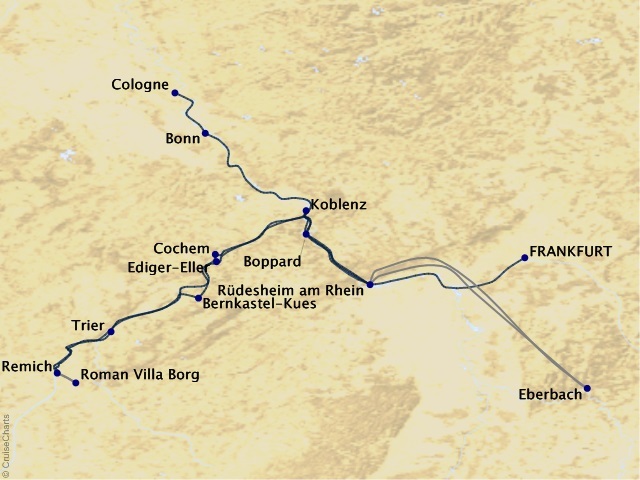 The Moselle Valley is a well known wine region and known for sparkling and white wine production. The St. Martin Wine Cellars, underground wine caves and cellars that have been cut into rock, offer tours and wine tasting to visitors. 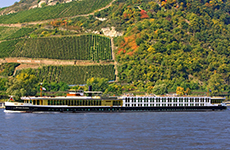 Visitors can also enjoy a glass of local wine while boating on the Moselle River. A tow path through the Moselle Valley is a great place to go for a bicycle ride. A tourist train can take vistors on an hour tour of the beautiful town or you can walk and stop in a restaurant with an indoor and outdoor patio during the summer. Arriving in the Moselle River village of Bernkastle, Germany, is like stepping back in time. With its red-roofed cottages, colorful flower boxes, and multi-paned windows framed with wooden shutters, childhood images of German fairy tales spring to mind. The cobblestone streets, enchanting architecture and steep green hillsides enhance the storybook ambiance of this picturesque little village. Located on the Rhine River, just south of Cologne, Bonn was once the capital of West Germany. Rich with history dating back to about 10 BC, the city is ripe with museums, monuments and scenic points of interest. Most notable however, Bonn is the birthplace of Ludwig van Beethoven, who was born in the city in 1770. Rates are cruise or cruise/land only, per person, based on double occupancy. Port charges of $220 and government fees/taxes are additional for all guests. Fuel surcharges may apply. Please ask your travel counselor for details. Rates are subject to availability and may change without notice. Restrictions may apply.